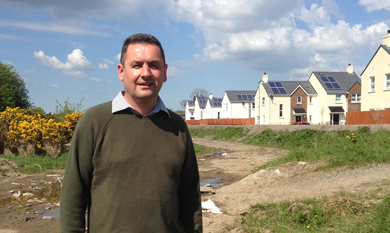 NEWCASTLE Councillor Willie Clarke (Sinn Féin) is making representations to APEX Housing Association and the NI Housing Executive to formerly request that land on the Castlewellan Road be made available for community ownership. Newcastle Councillor Willie Clarke is calling on public bodies to allow local communities to develop play and recreation areas. Councillor Clarke said: “I will be emphasising the need to work in partnership with the community and the local Council to develop play and recreation provision in what I believe is an area of the town most densely populated with children and teenagers yet totally deprived of such necessary facilities.This area is also the most socially disadvantaged area of Newcastle. There are strips of land in and around these developments that possibly could be utilised for recreation purposes he said adding: “As a result of lack of recreational facilities, we have large numbers of young people congregating in an around these developments and at times this becomes a source of complaint in terms of low level anti-social behaviour. “However, the number one issue for families is the lack of facilities for their youngsters in these areas and there is wide recognition that the provision of much-needed facilities would alleviate much of this problem. “I believe there will be suitable grant opportunities for such community/social infrastructure including the Space and Place consortium (Big Lottery funding). While there is a real need to have green space for young people to play, the untapped land can be properly managed to possibly include a community garden or allotments, sports area, and a play area, in my opinion we have an opportunity to develop a project to turn a derelict area into a people’s park which could include cycle paths and walkways where people can meet and enjoy their local space. “I acknowledge the goodwill that exists among my Newcastle Down District Council colleagues to also progress this issue and I will be keeping it firmly on the agenda in the time ahead,” said Councillor Willie Clarke.